2016 Christmas card for Andy Bell’s fabulous Veg-in-Clover organic veg-box scheme in Oxford. 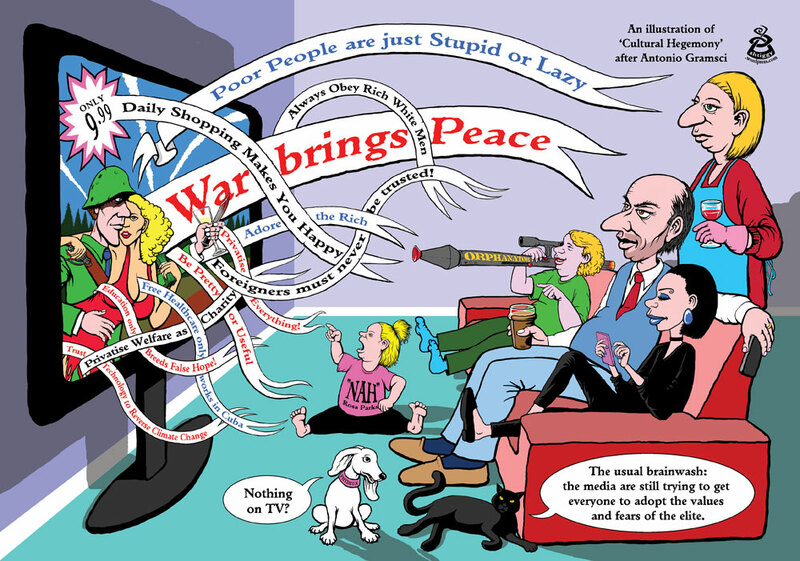 An illustration from 2016 of the very useful concept – ‘cultural hegemony’ – as define by Antonio Gramsci, and mentioned by George Monbiot in his recent book ‘Feral’ (that proposed the rewilding of Britain). 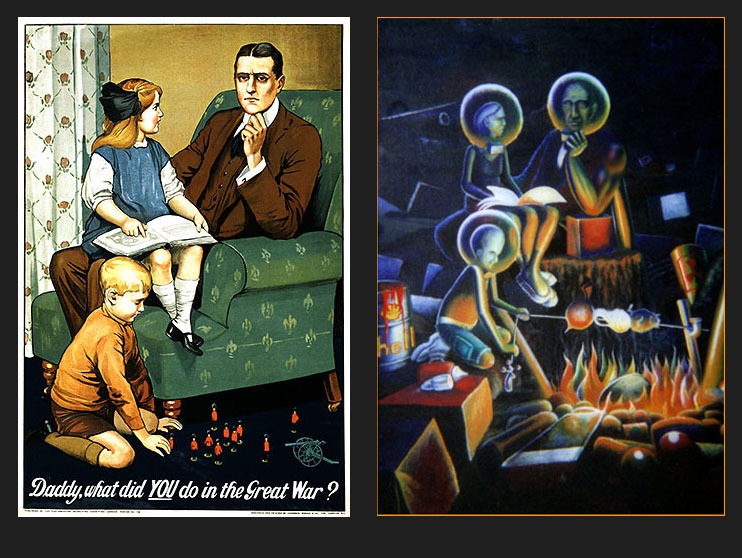 Cultural Hegemony is the tendency (mostly through self-censorship) for the main-stream media (MSM) to bombard consumers with imagery and stories that encourage us to adopt the values, attitudes and fears of the “ruling elite”. This idea is very in-line with much of the writings of Noam Chomsky too, especially in relation to his criticism of the “main-stream media” who define the goal-posts or range of the ‘permissible debate’. 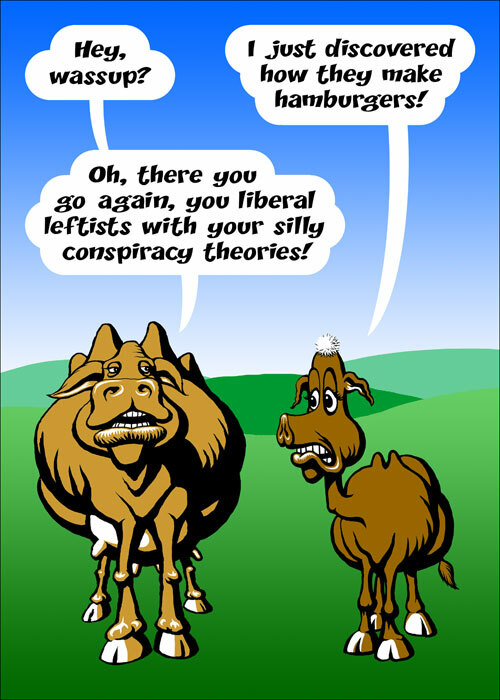 This cartoon is one of my all-time favourites. 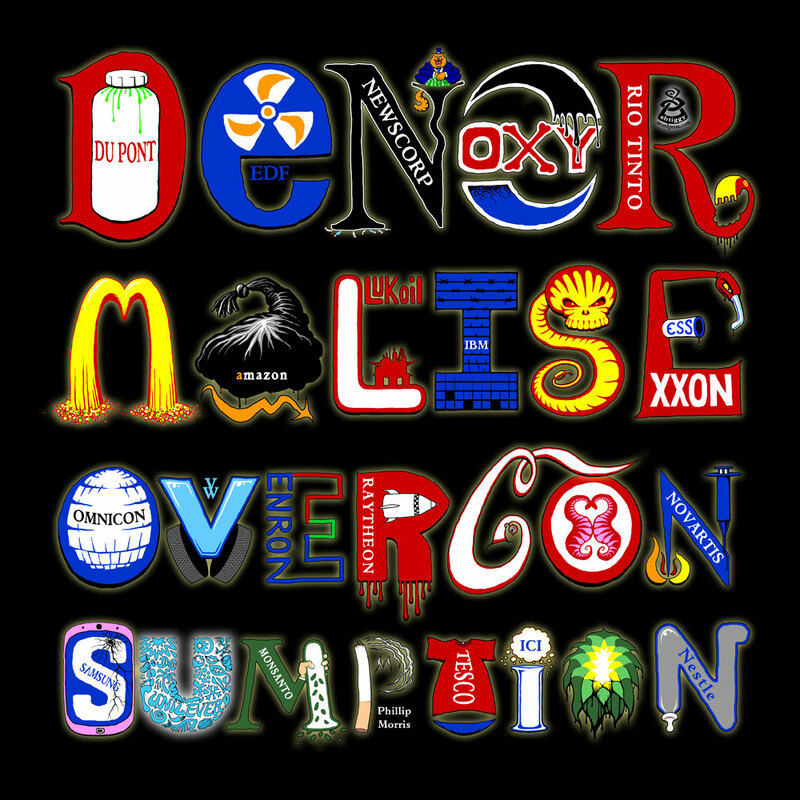 Poster from 2015 to mock some of the world’s largest corporations who are doing so much to destroy our planet. Most folks will know many of these logos. Omnicon are one of the largest advertising / public relations groups – who spend billions trying to persuade us to buy more and more stuff that we don’t really need. LukOil are one of Russia’s largest oil companies, and are involved in drilling in the arctic. It has been estimated that about half of the household goods we buy from shops in the UK will end up in landfill or ‘recycling’ within a year. In many parts of the western world, recycling actually involves shipping huge unsorted containers of waste across to poorer countries in Asia where it might be ‘processed’ and or just dumped or incinerated. These countries often have far weaker labour and pollution regulations that the richer northern countries, so our waste may be polluting their rivers, and sorting through our ‘recycling’ may be the full-time job for children who should be at school. 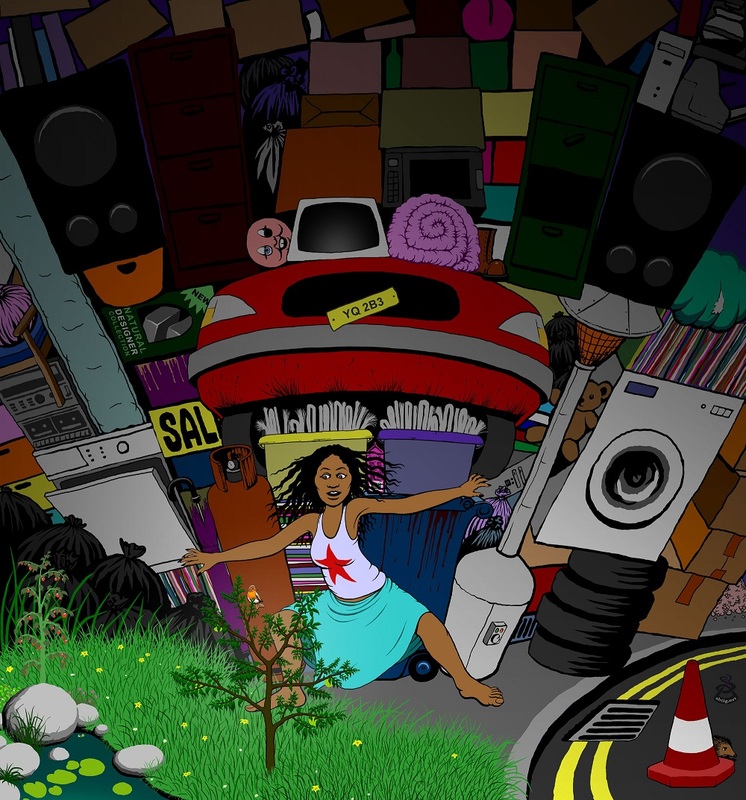 A 2014 Cartoon inspired by photos of people stranded on their car roofs in floods, and reading about the collapse of the Peoples of Easter Island by the likes of Jared Diamond. This is a spoof of Rodin‘s fantastic statue ‘The Thinker‘ and Banksy‘s parody of it called ‘The Drinker‘. 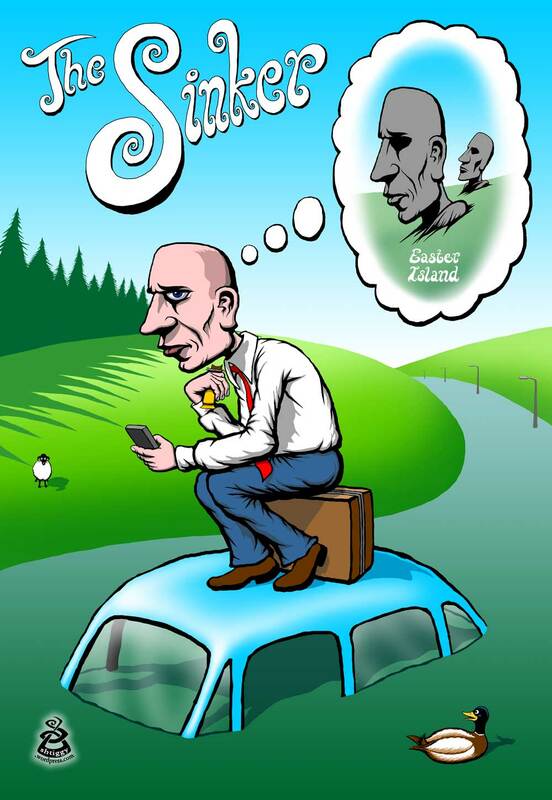 This cartoon suggests that a personal climate-catastrophe like being stranded in a flash flood on the way home from work will help western man see how fragile his existence really is, provoking him to realise that he may need to ACT to help humanity avoid catastrophic climate collapse, or face a bleak extinction like the folks on Easter Island. The sheep was added in reference to George Monbiot‘s illuminating research and writings linking sheep farming to hill-top soil erosion to local flooding in England. 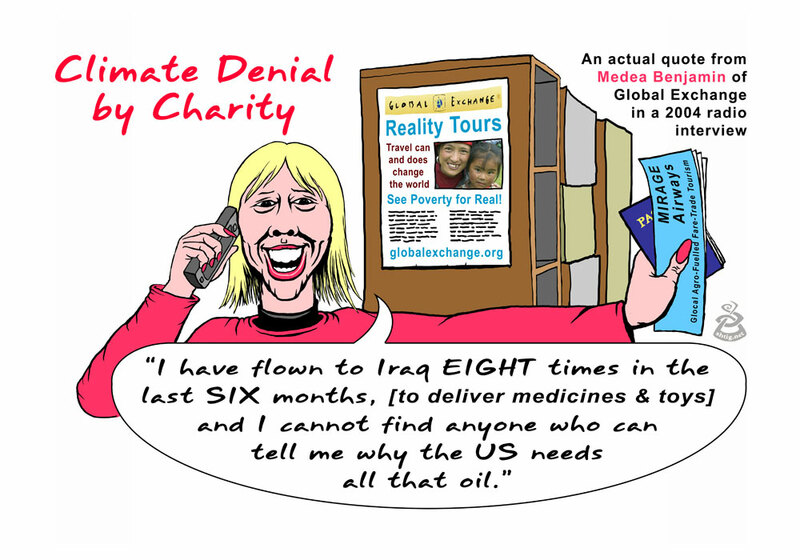 Cartoon finished in October 2014 that has been bubbling in my mind for a while… trying to show the link between addiction and violence – fossil-fuel and war, especially in the Middle East. George Marshall helped with the concept of the row of bottles. 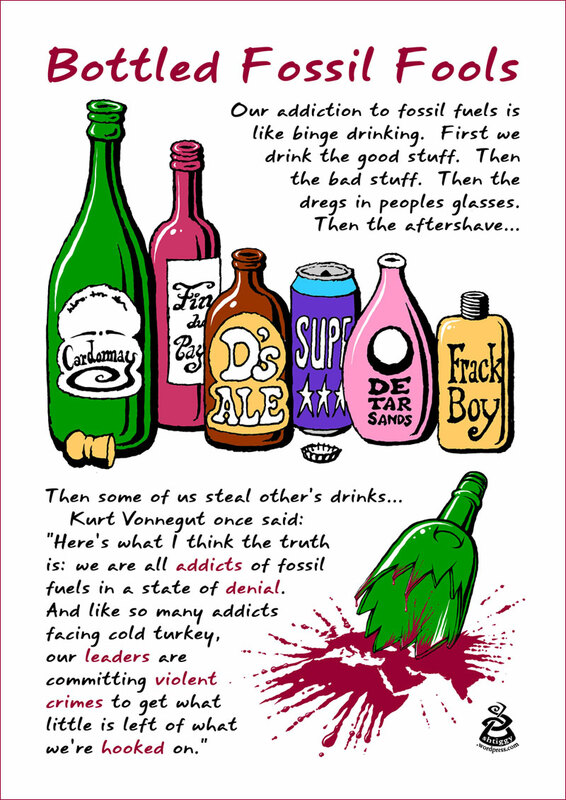 Reminds me of the excellent work of Richard Heinberg at the Post Carbon Institute whose latest book exposes the sham that is fracking – “Snake Oil“. I read a while ago that one of the main causes of the first world war was the competition between Britain and Germany for middle Eastern oil. Both countries were using coal to power their navy, but switching to oil was a great way to have faster battle-ships – but relied on securing supplies of oil – which just happened to be under other peoples’ sand, in the Middle East. I am reminded of a great poem by Biff Vernon “I-will-not-commemorate-war” which is well worth a read. 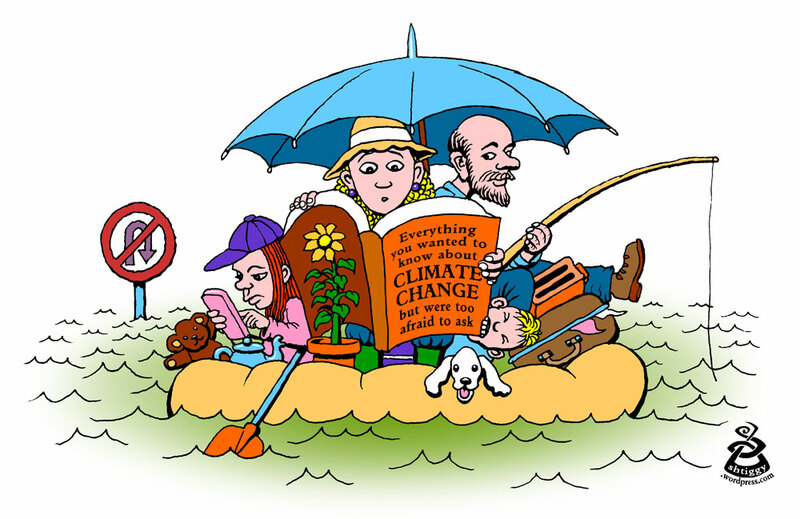 Cartoon from 2014 to provoke thought on ‘western society’s inability to face the multiple threat of climate change, September 2014. This was inspired by a late night camp-fire chat with George Marshall who has just published his new book “Don’t even think about it: Why Our Brains Are Wired to Ignore Climate Change”. George works with COIN, the Climate Outreach and Information Network, in Oxford. And… I have finally started reading Naomi Klein‘s new book “This Changes Everything: The Climate vs Capitalism“. A 2014 drawing (for my friend Scilla), quoting a snippet of a poem by Charlotte Tall Mountain that seemed very apt. 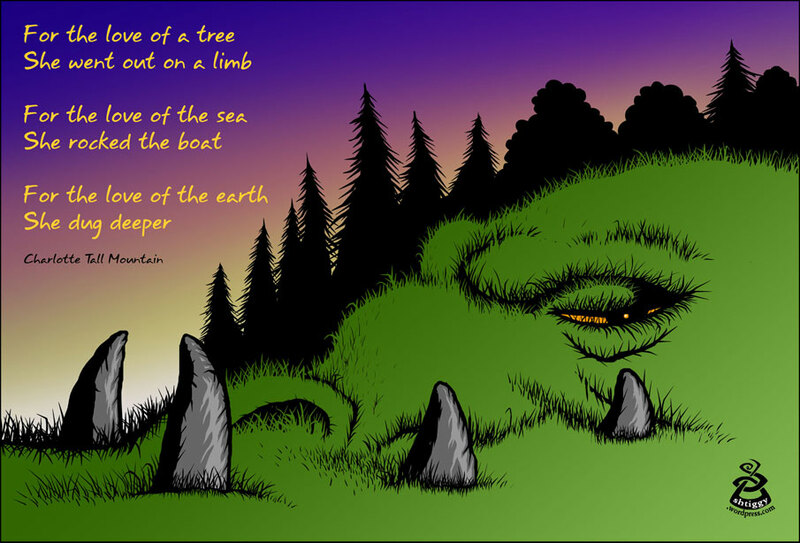 The image is inspired by a play on the Celtic idea of the Addanc – a great serpent that slumbers under the hills and must be placated (fed sacrifices) or else he may waken, rise up and eat us all up! I like to see the great Addanc as a dragon who represents the natural world, including the people and animals and plants that live in harmony with the earth and with each other, mostly sleeping, but now beginning to stir and awaken to take on the threat to all life: the machines of corporations! EARTH WAKE – Grrraaaaarrrrrr!!! must be strengthened” – Madame de Stael. 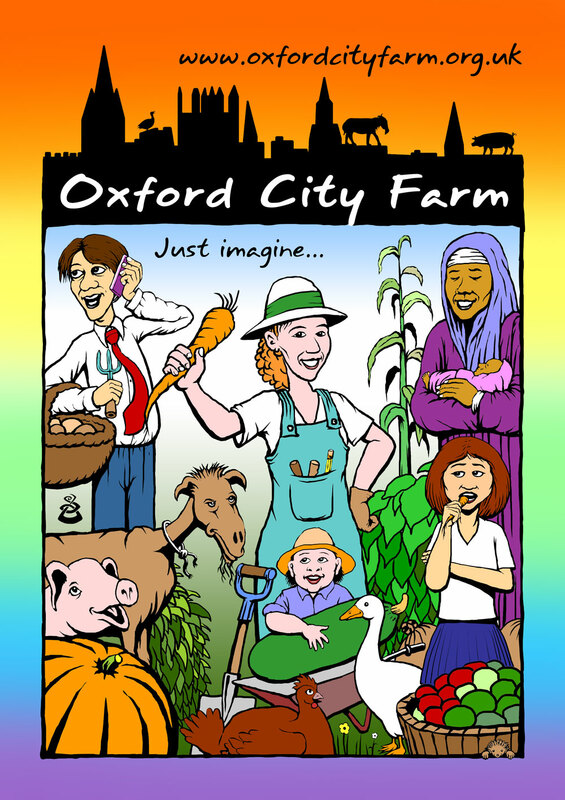 A 2014 postcard and e-card for the lovely folks at the Oxford City Farm. This project has been rumbling on for many years, delayed by the Council. A site in East Oxford looks likely but the bureaucracy is so slow! 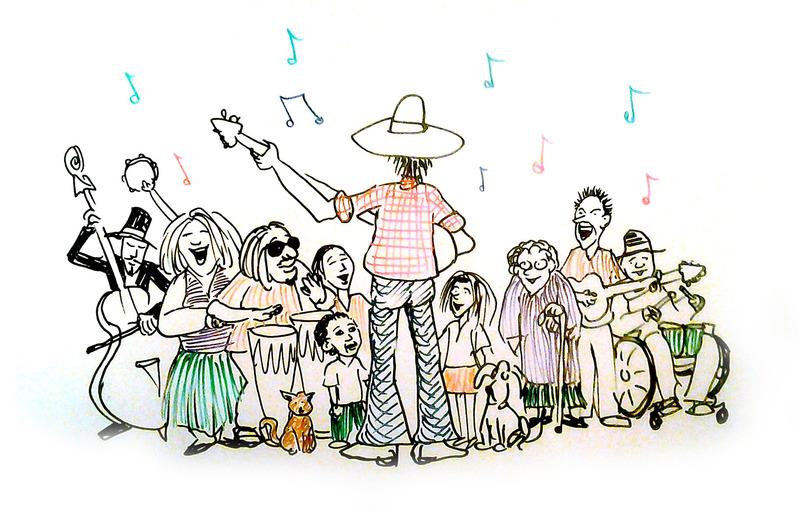 When the farm eventually starts, many people will find much to learn, do and enjoy. One concern I have is the well-being of the animals. I am sure great efforts will be made to ensure that any animals that do live on the site will be given a very good life – far better than most farm animals. What makes this ok, for me as a vegetarian, is that when Oxford folks, especially kids, visit these animals they will likely come to realise that these animals are sentient, feeling, may even have personalities, relationships, etc. This is likely to help some people realise that going vegetarian or even vegan is a wise move, for many reasons. Cartoon that I finally managed to colour in, in 2014 . 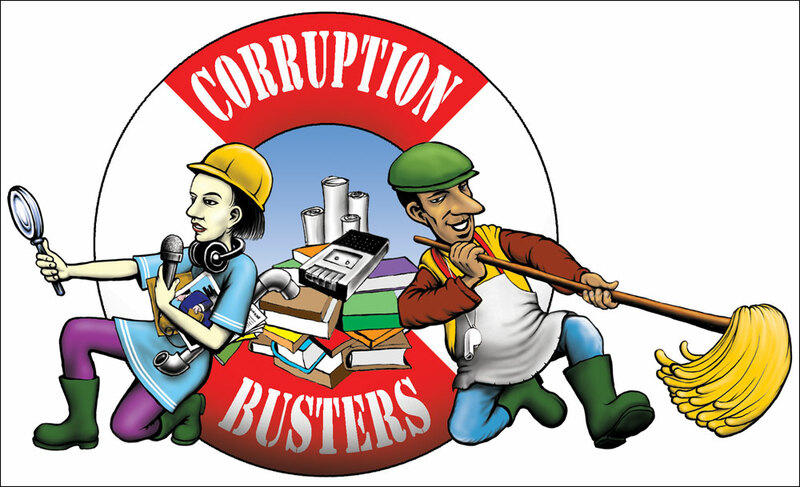 This was drawn for Corporate Watch UK a few years ago, and never used. 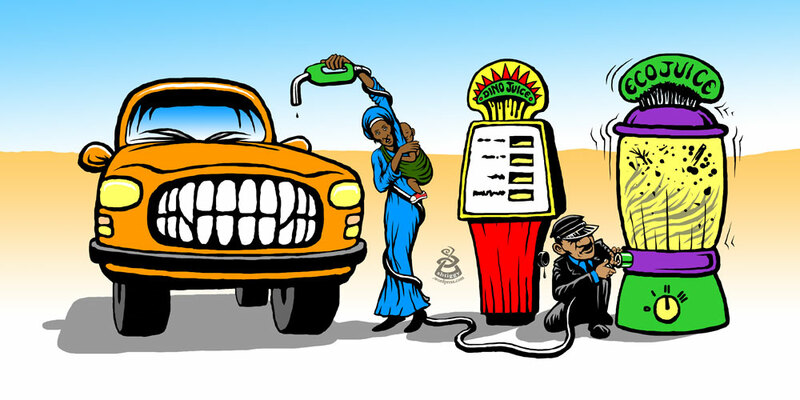 I have tried to show how the greedy car is switching it’s fuel supply from petroleum oil to bio-fuel. There are many reasons to reduce our use of fossil fuels, but switching to bio-fuels can often lead to huge new problems. When some European countries became interested in fuels made from plants, there was a sudden spate of deforestation in the far east, especially Indonesia, to provide land for new plantations to grow the plants to make the bio-fuel. So natural habitats were damaged. Also, diverting land from growing food to growing fuels is wrong. For more information on the threat posed by bio-fuels, please visit BiofuelsWatch. A fun 2013 cartoon based on a true story, as witnessed by my uncle, Peter. 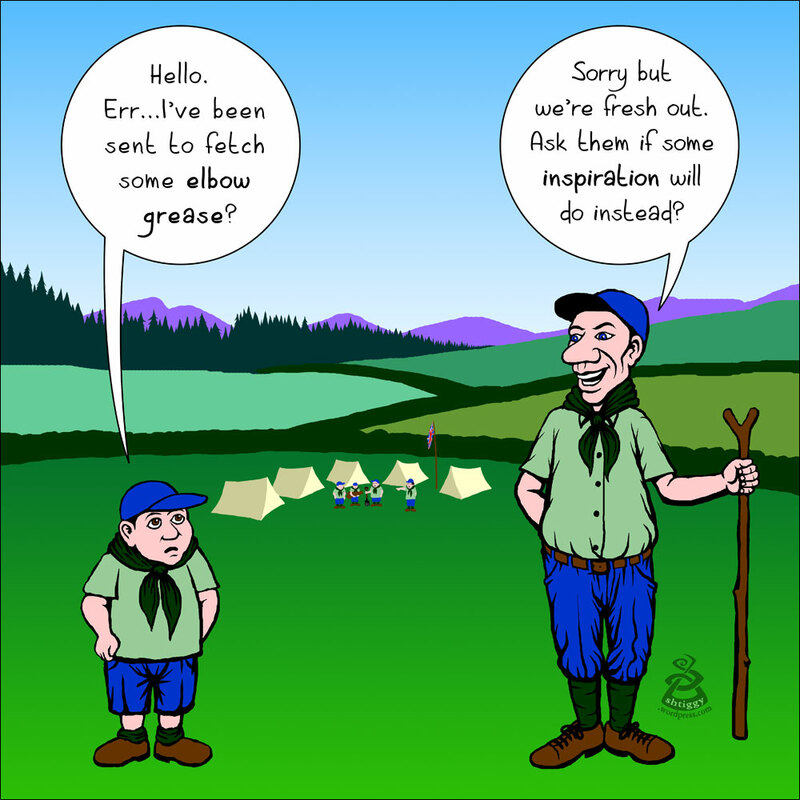 He is publishing a series of amusing memoires and this cartoon will be used for the booklet covering his time as a scout-leader. (The phrase “elbow grease” means ‘physical effort’ in most western english-speaking societies). 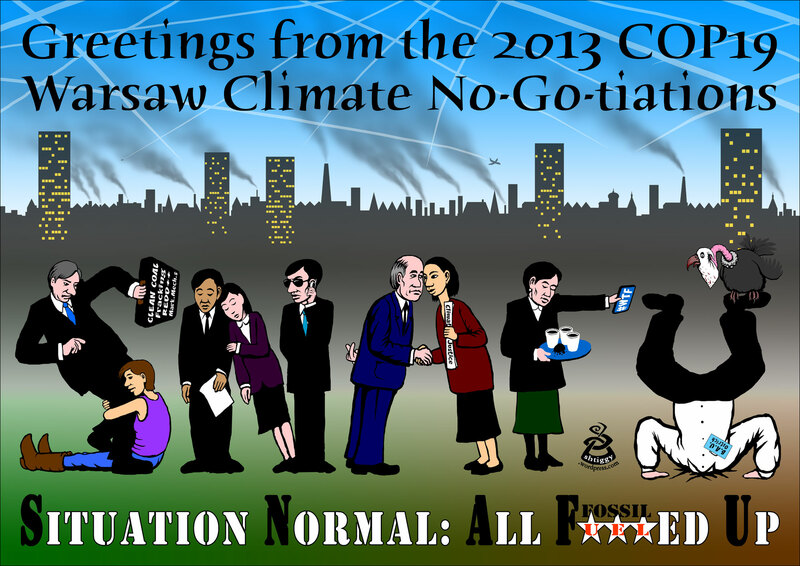 ‘Greetings’ Postcard from the UN’s Climate Negotiations in Warsaw. Representatives of Civil Society have just walked out, en mass, in protest at the lack of progress, on Thursday 21 Nov 2013. There is excellent coverage of the ongoing fiasco in a few places, including at the TckTckTck website, Oxfam, RTCC, and the Guardian. 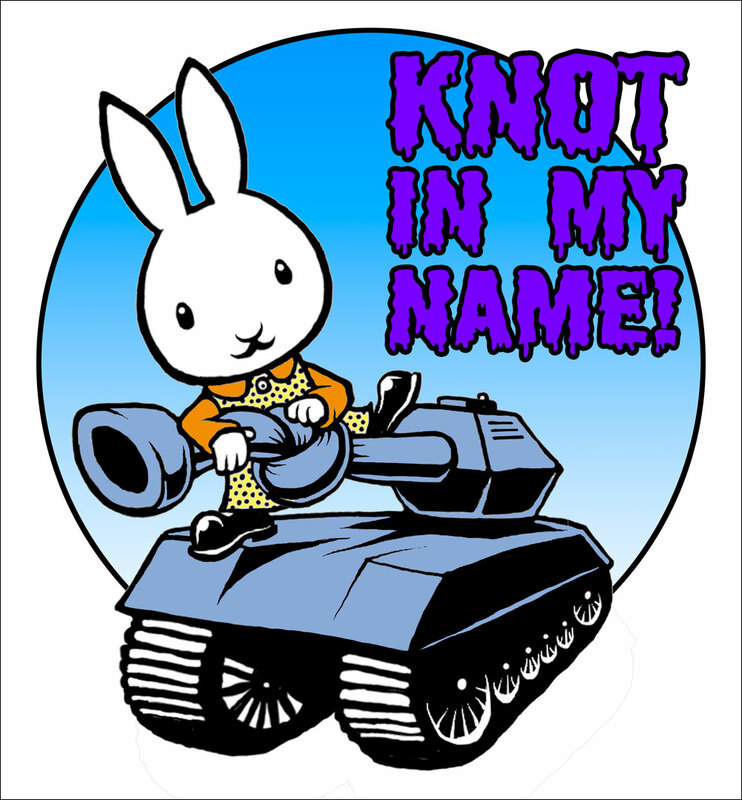 For those who don’t know, SNAFU is a slang acronym, originally from the US army, that stands for “Situation Normal: All F***ed Up. Pardon my language but this seems to be a very apt use of the phrase – the UN climate conferences (UNFCCC) have been going for over two decades with VERY little progress. 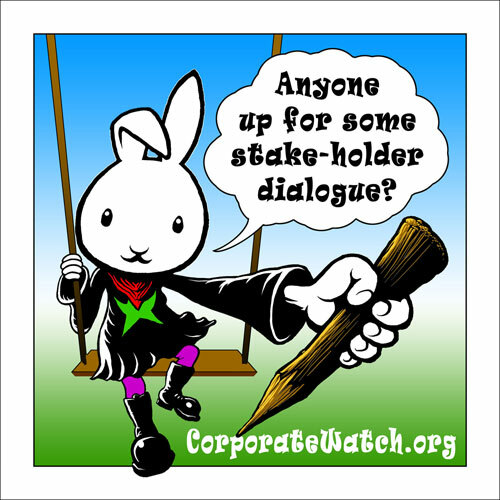 This year’s conference in Warsaw was inundated with corporate lobbyists, sponsorship from polluting corporations and very little appears to be moving forward. Over 1000 people have joined a hunger strike to put pressure on the negotiations to deliver, led by the representative from the Philippines, Yeb Sano. The rich ‘over-developed’ countries have created most of the emissions bringing on climate chaos. They also have the funds and the technology to fight Climate Change. Yet they are showing very little initiative or responsibility. This cartoon was inspired by the determined activists of the UK Youth Climate Coalition (and friends) who used their bodies to spell out “W T F ?” referring to “Where’s the Finance?” for the Green Climate Fund – an international fund to help the poorest nations defend themselves against Climate Chaos. While the situation looks bleak, there has been much alliance-forming at Warsaw. 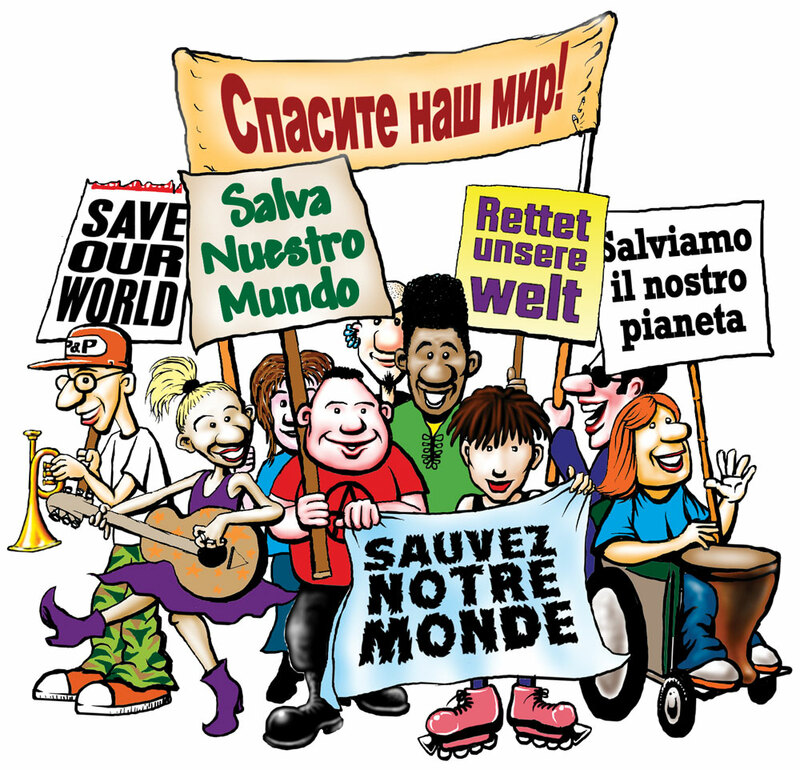 I hope NGOs and poorer nations can unite against the corporate take-over of the UNFCCC, and put pressure on the richer nations to get reponsible and together, act on this gravest threat to our planet’s future. 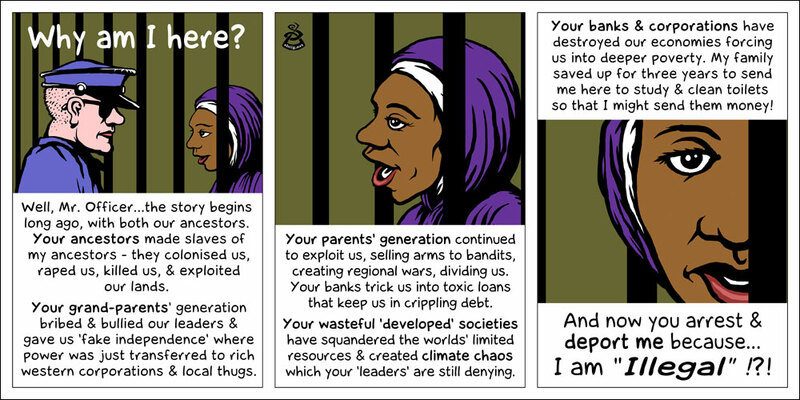 Cartoon from 2013 inspired by the street activists who led the so called ‘arab spring’ (many of whom are women). friendly folks at CARA to make a contribution to a fund-raising auction. 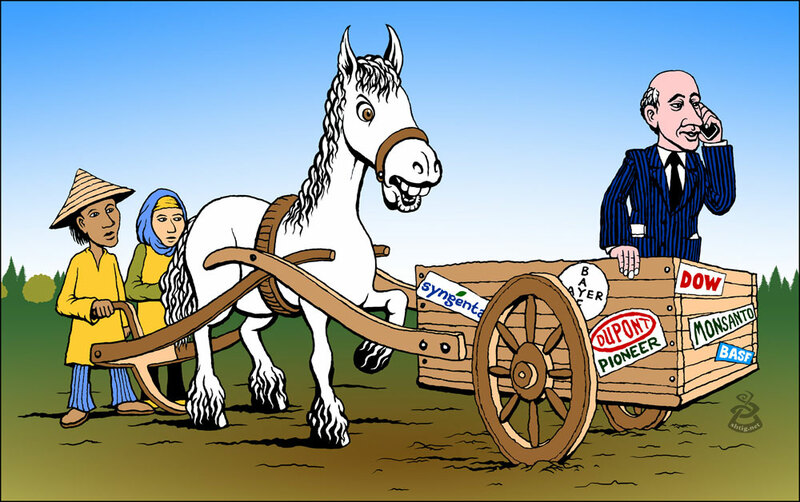 A fun 2013 cartoon for the ETC group, “Putting the Cart(el) before the horse” is used on the front cover of their latest report “Who will control Agricultural Inputs?” that exposes the increasing corporate control of the world’s agriculture systems. See the report on their website, including a huge (and growing) 6-page info-poster that compares the ‘corporate food-chains’ with the ‘peasant food-webs’. 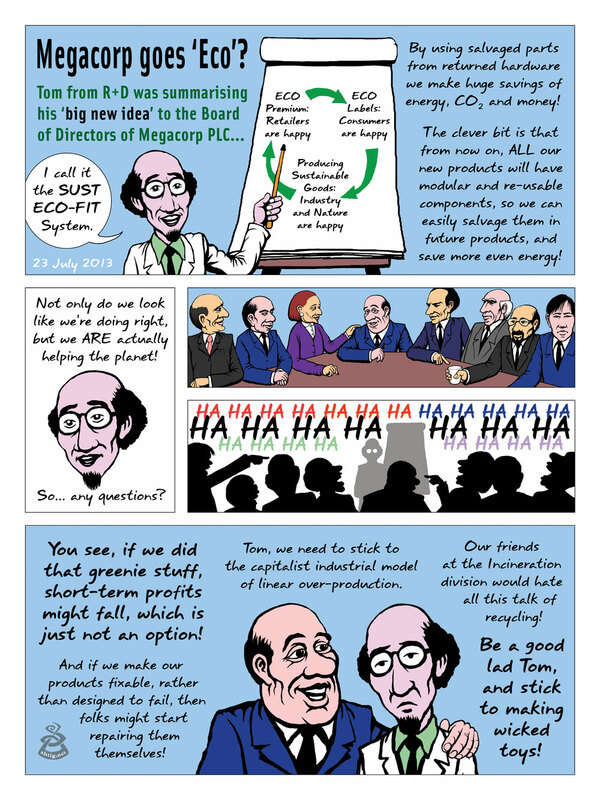 Cartoon strip from 2013 exploring the idea of “sustainable capitalism”. Is it possible? Many think that this term is an oxymoron. Could it work? 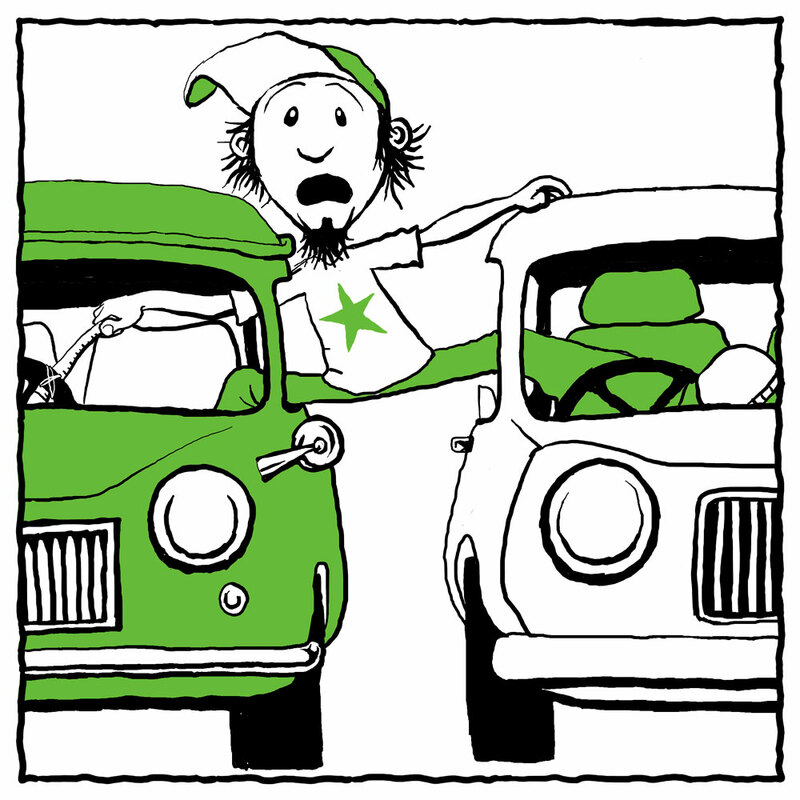 Can we hope to transform our eco-cidal economy without changing the way big business operates? 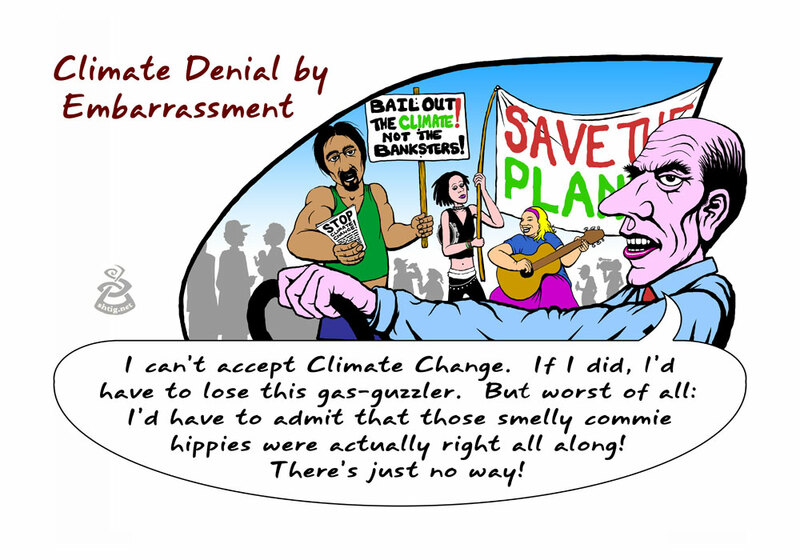 This is the fifth cartoon in an ongoing series that explores different forms of people’s denial of climate change. The other four are shown further down on this page. 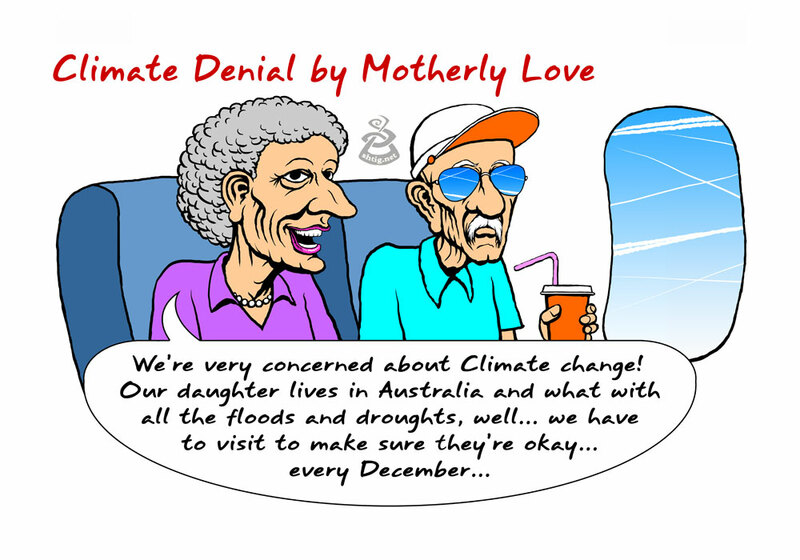 Clive Hamilton in Australia and Naomi Klein in Canada have written very powerfully on climate denial, and inspired these cartoons. 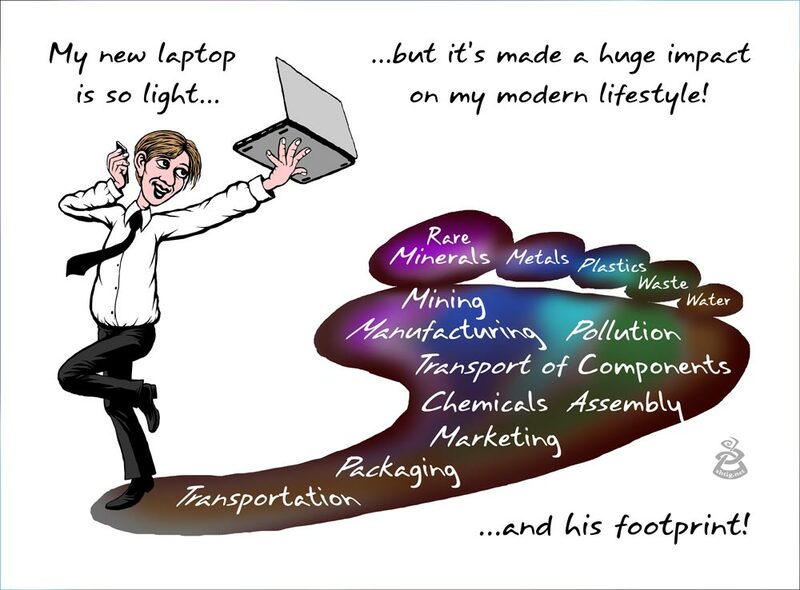 Cartoon from 2013 explaining the extent of the ecological impacts of so-called “high-tech” gadgets. This reminds me of a great concept I heard the other day in the novel “Entropia”: you have heard of ‘Less Developed Countries” (LCDs). Well how about the “Over Developed Countries” who have developed a lifestyle that is beyond the carrying capacity of the planet. What a useful concept! 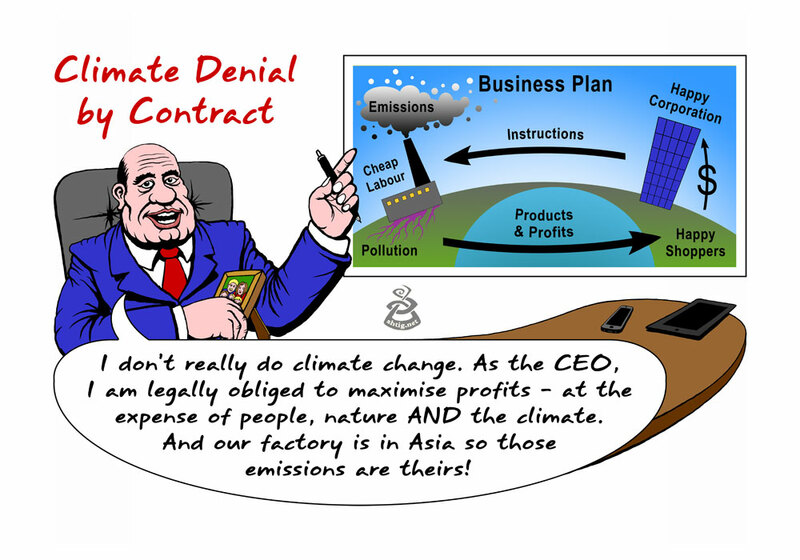 Drawn around January 2012, these cartoons were inspired by Naomi Klein‘s article in The Nation: Capitalism vs Climate. 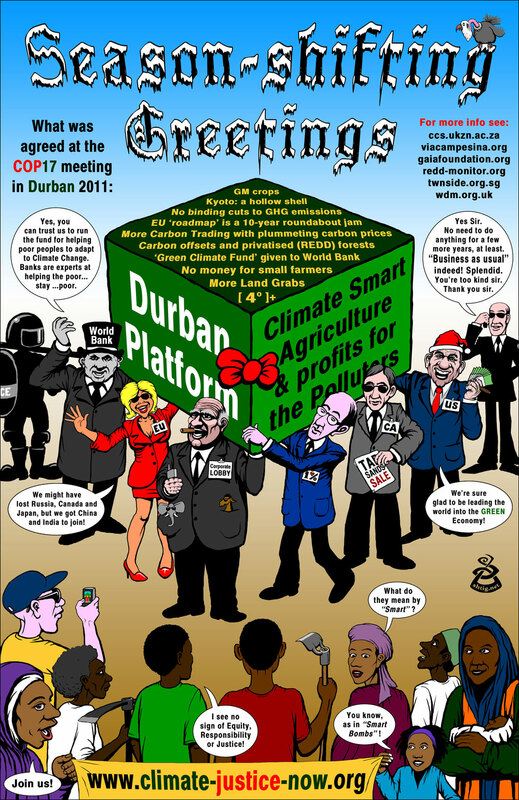 A cartoon-infoposter and Xmas card from Durban 2011, summarising what happened at the COP17 Climate Conference. 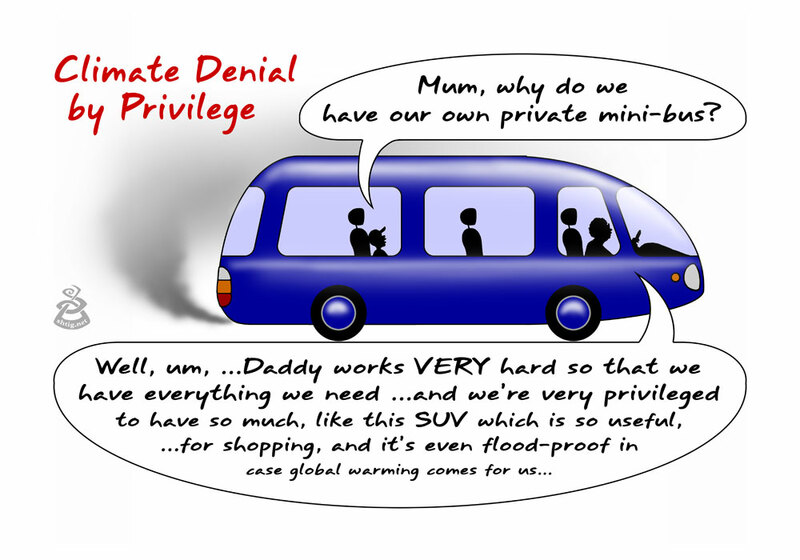 Daddy, what did YOU do in the Climate Crisis? 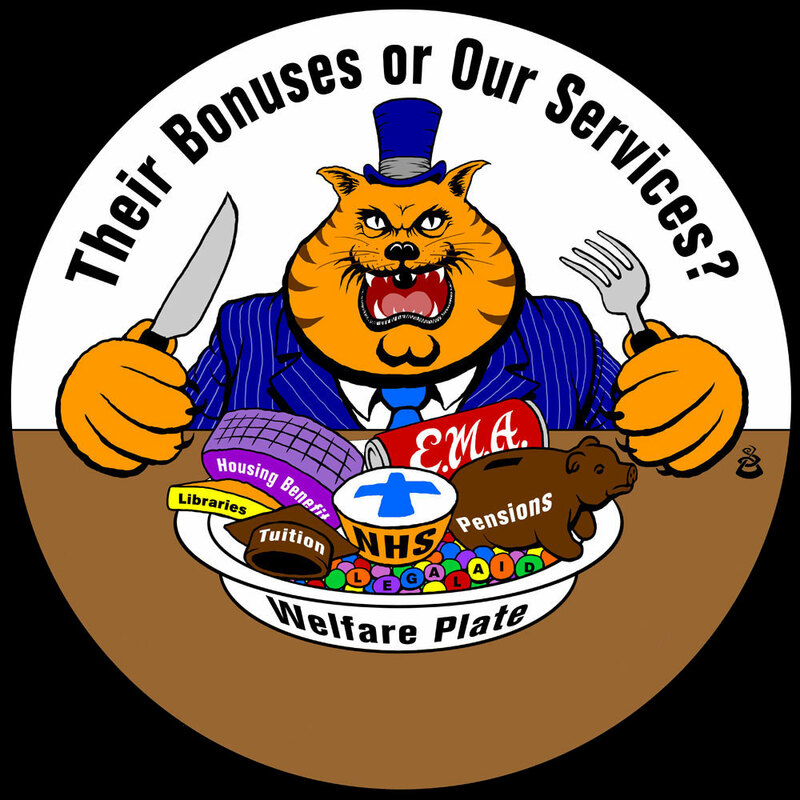 October 2011 – Cartoon / logo for my friend Joel who thought up this clever idea, a parody of the ‘Welfare State’, under attack in Britain from the ‘austerity’ movement. 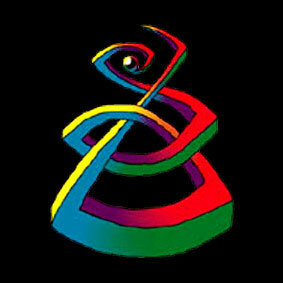 If you want to use this logo for your own protest / event / blog, we’d be delighted. There is room at the bottom for your own message or website address. Email us if you want a larger / print-quality version. 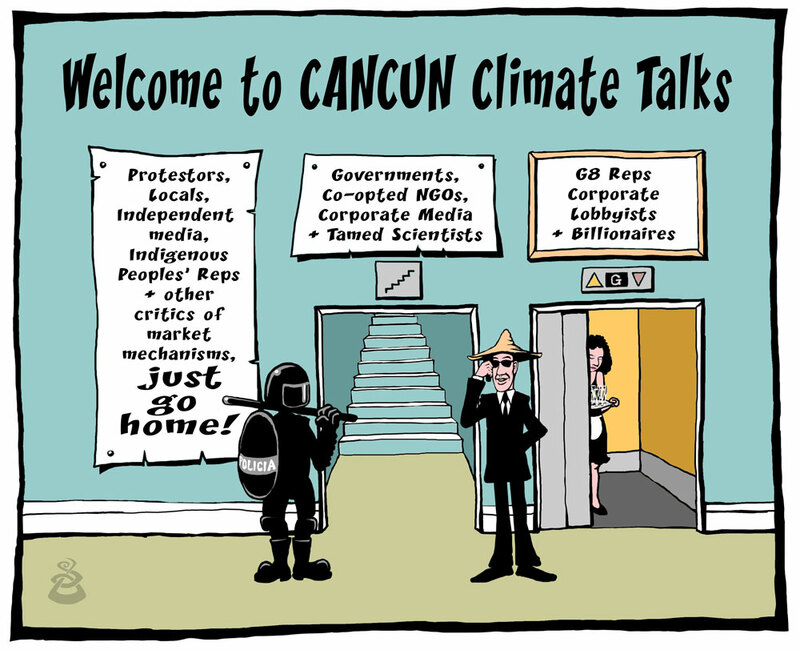 December 2010 – Cartoon for the Cancun COP16 UN meeting on climate change in Cancun, Mexico. 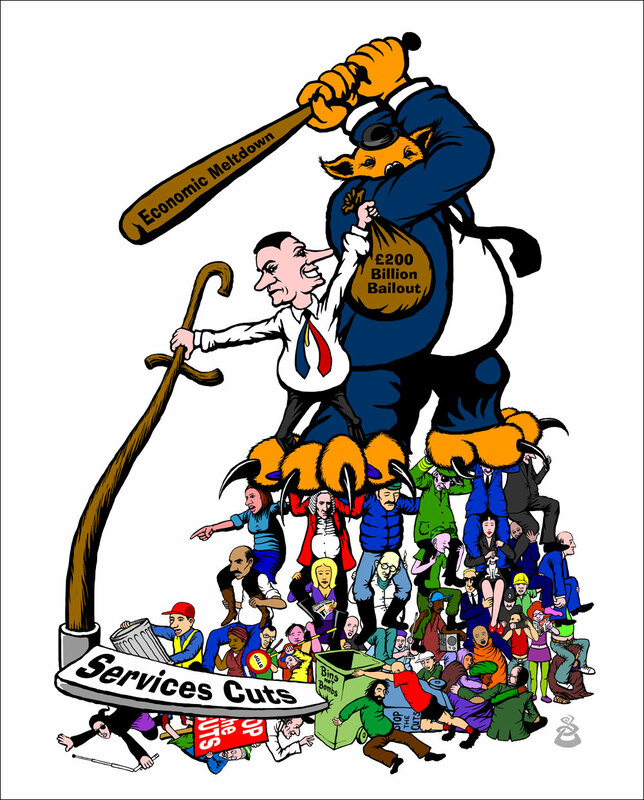 Cartoon from 2010 that was devised by my friend Dan, a teacher in Bath, who is quite involved in anti-“austerity” activism. It’s been used in a number of places. 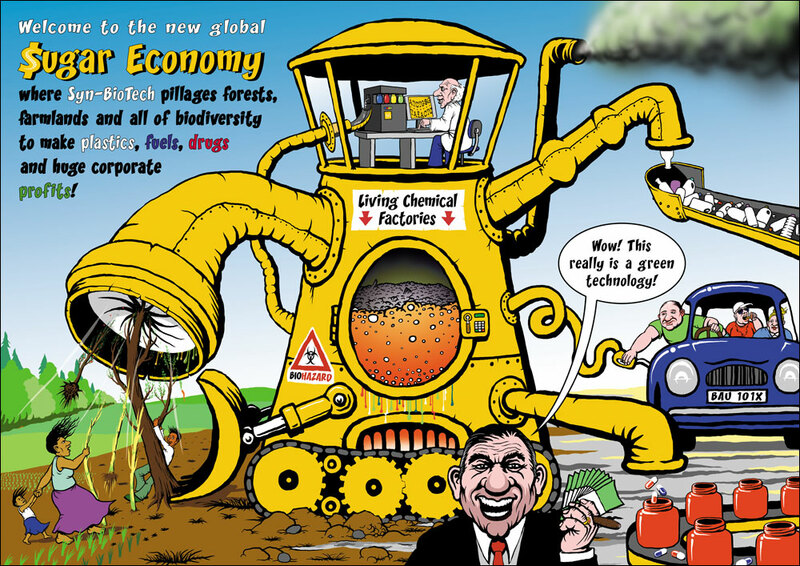 A cartoon for the ETC Group to illustrate key ideas on Nano-particle pollution for their 2009 report “The Big Downturn”. See the Nano-tech section of their website for more details. Cartoon based on an idea I heard in a speech from Michael Parenti. 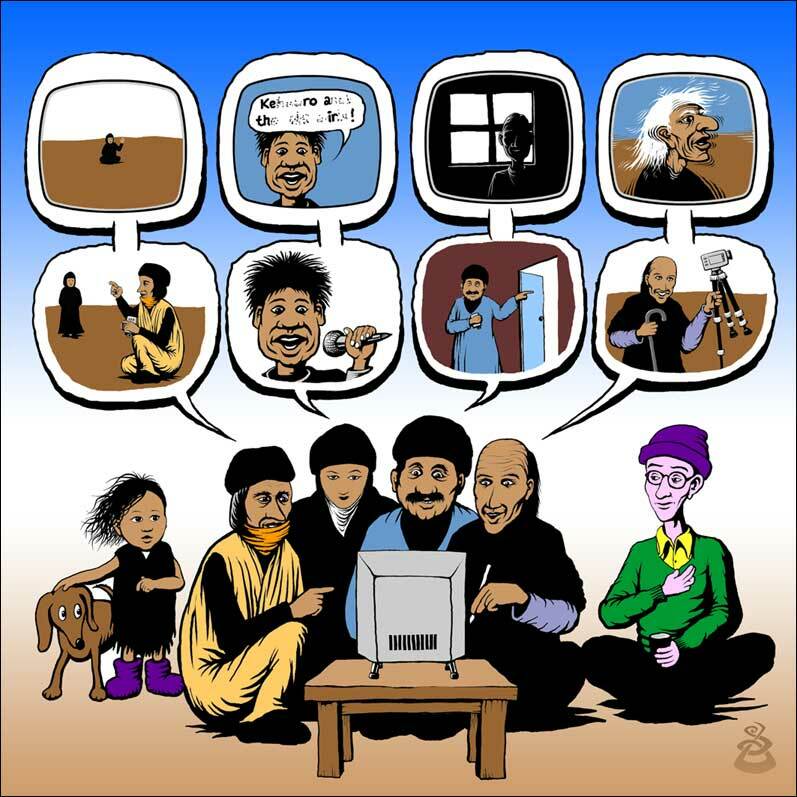 Cartoon from 2010 that was brewing in my mind for many years. Finally I made the time to draw it and it has been used in many places. 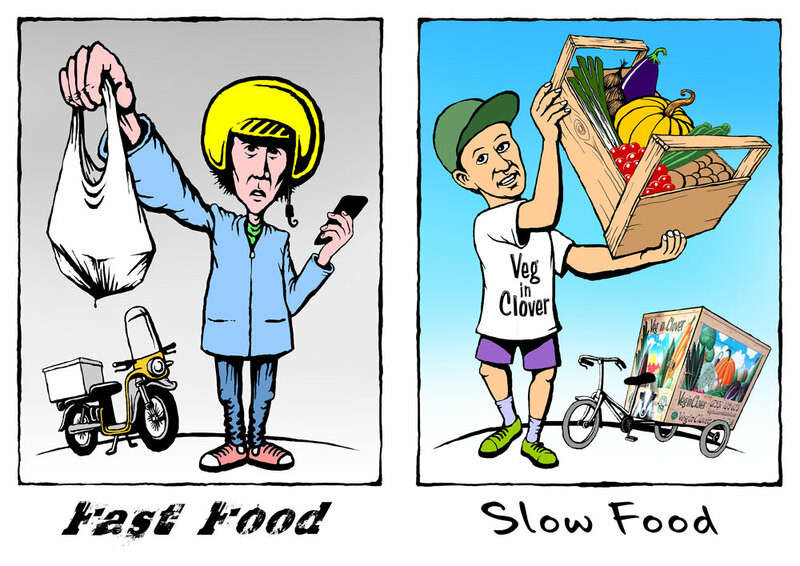 Cartoon for the ETC Group to explain the ‘new sugar economy’, in 2009. 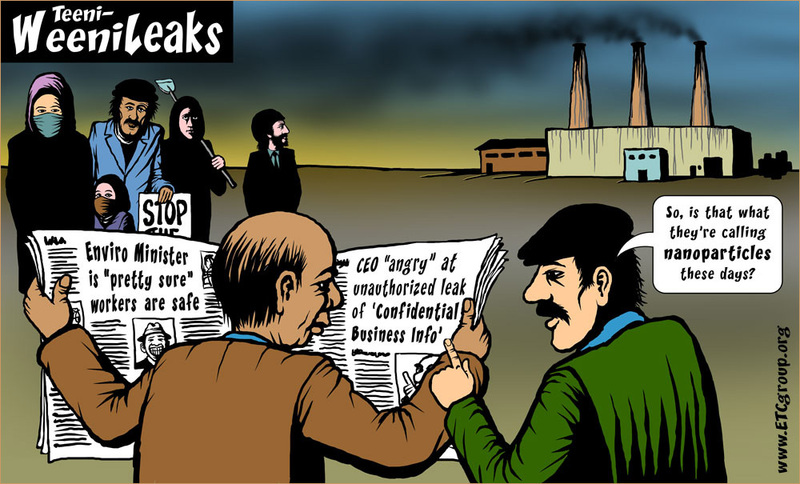 Cartoon for the New Internationalist from 2009. 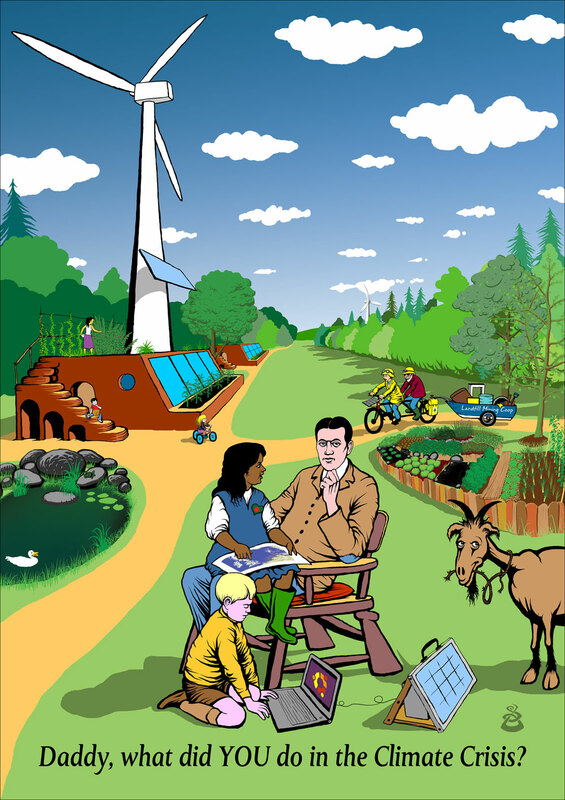 A simple cartoon for the ETC Group in 2009 who were calling for Technology Assessment at the Copenhagen Climate conference. It’s a simple yet powerful idea that there should be open and transparent testing of ‘new technologies’ BEFORE they are rolled out commercially, and dumped into poor countries. 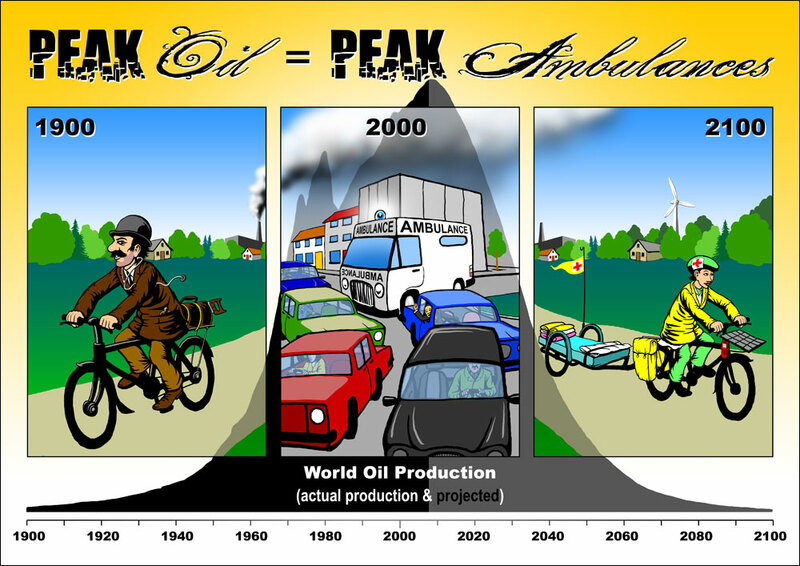 Cartoon from 2008 comparing ambulances from before, during and after the ‘oil bubble’, inspired by Richard Heinberg of the Post Carbon Institute. I do not really agree with the idea of petrol-powered vehicles, but I do think that fire-engines and ambulances are exceptions, for now. 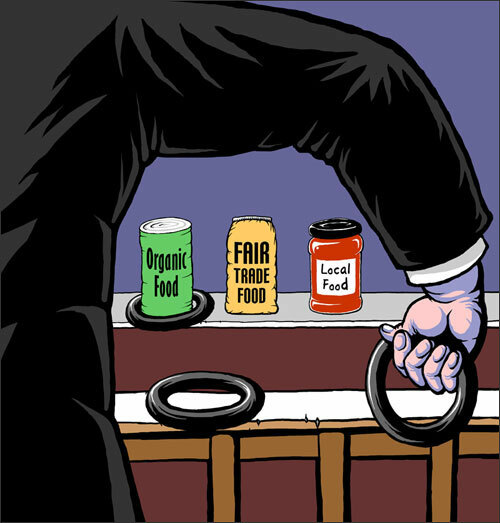 Cartoon from 2008 for a Corporate Watch investigation into the corporate take-over of our food systems – where huge multi-nationals buy up and corrupt “organic” foods, then “fair trade” and then even “local” foods. 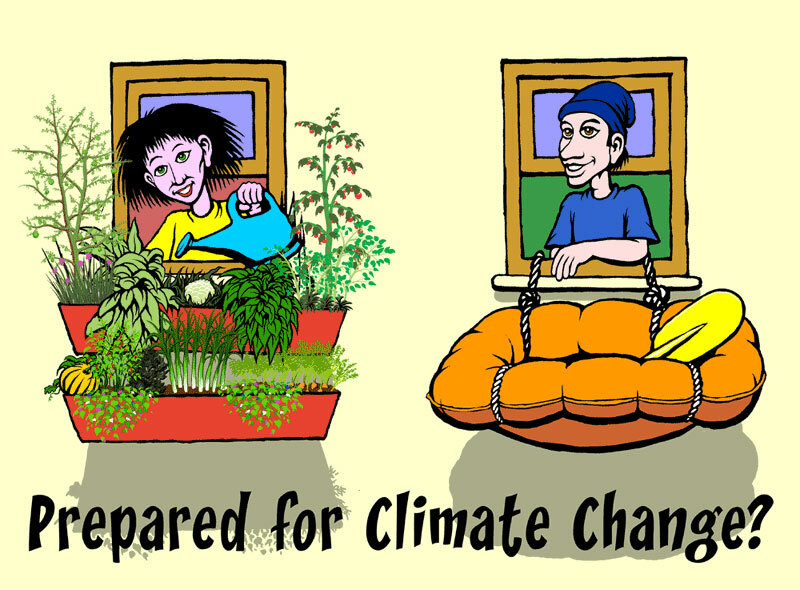 Cartoon exploring different responses to climate change, from 2007. 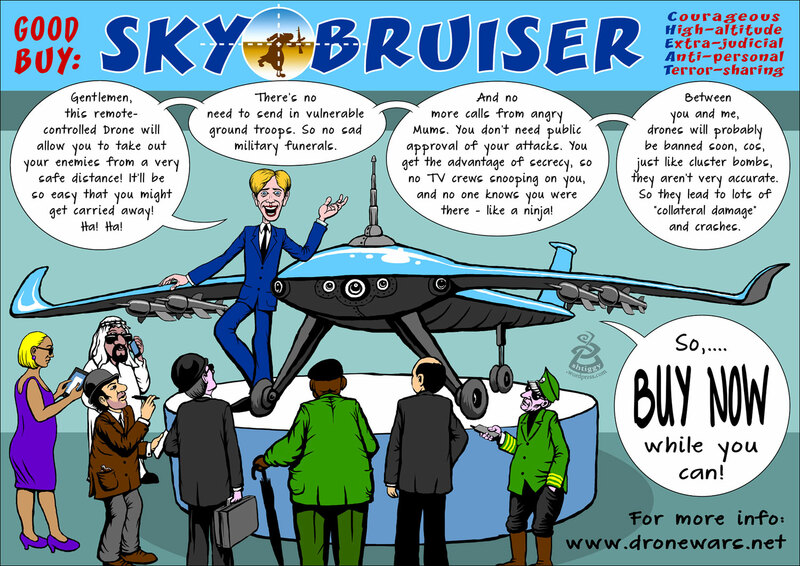 Cartoon from 2006 for Corporate Watch (UK) playing with a more ‘spiky’ angle on dialogue with the ‘demigods’ of our era – Transnational Corporations. My pal Danny recently suggested that today’s energy corporations are probably the most powerful man-made entities in all history. And they are acting in ways that threaten life on earth just to maximaise profits – the vampire analogy seems quite fitting. 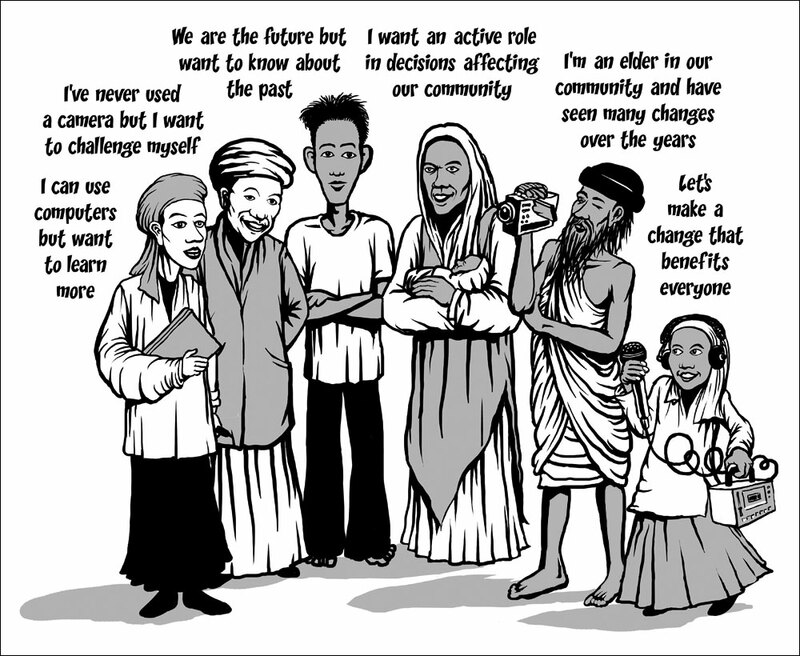 Cartoon for Seeds for Change from 2005, showing how a variety of diverse campaign tools an be combined in one campaign. 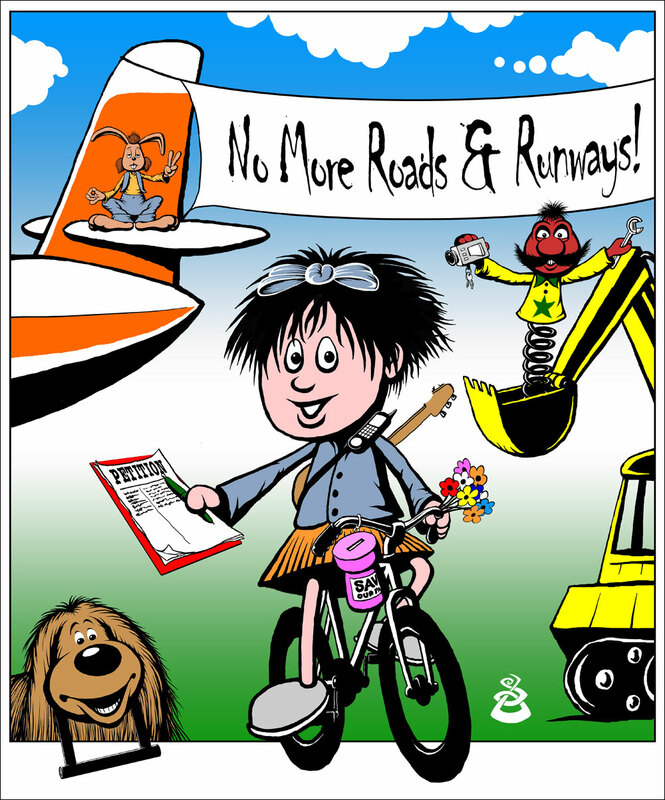 The characters are from the popular ‘Magic Roundabout‘ TV show that many people may know from the 1970s and 1980s. Cartoon from 2005 for some Oxford friends who are campaigning against the new Oxford University Animal-testing laboratory. 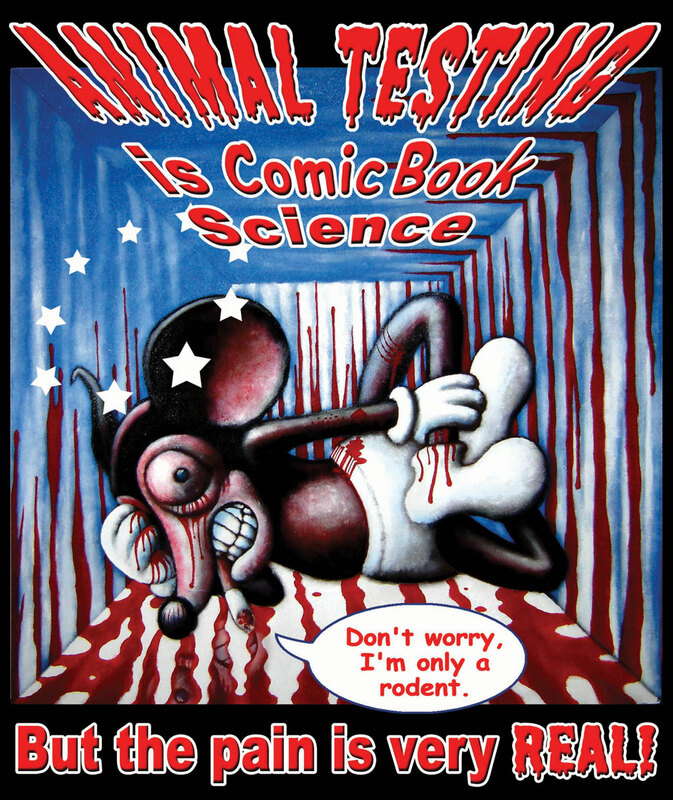 Some folks believe that testing on animals is useful for developing new medicines. Others are very sure that animal testing is not helpful as some chemicals work differently in animals as compared to humans. Abusing and killing animals to help students learn about biology seems quite wrong to me. There is a lot of interesting information on the SPEAK website. 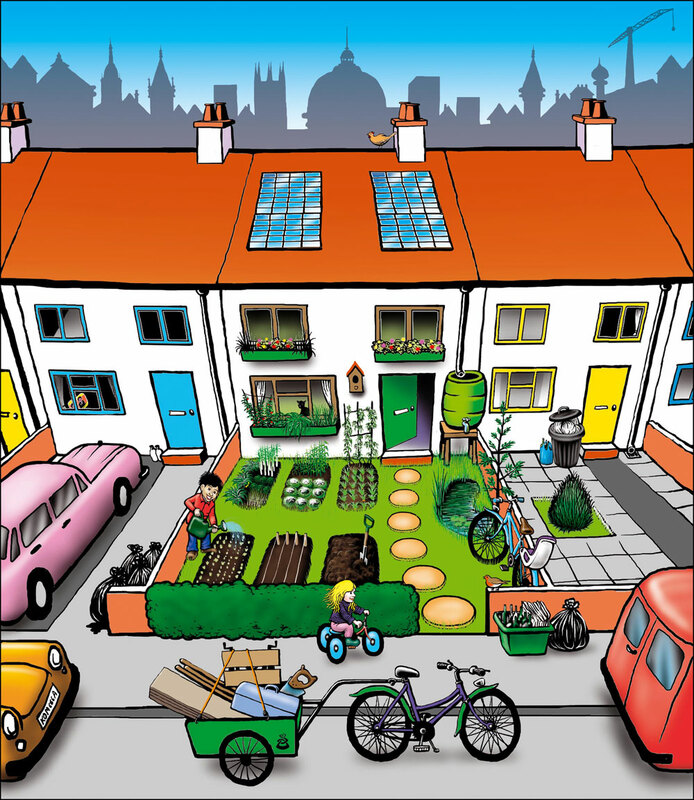 A cartoon drawn for the cover of the very useful “Green Guide to Oxford” booklet published by Oxford GreenPrint,around 2003, and used in many other places. 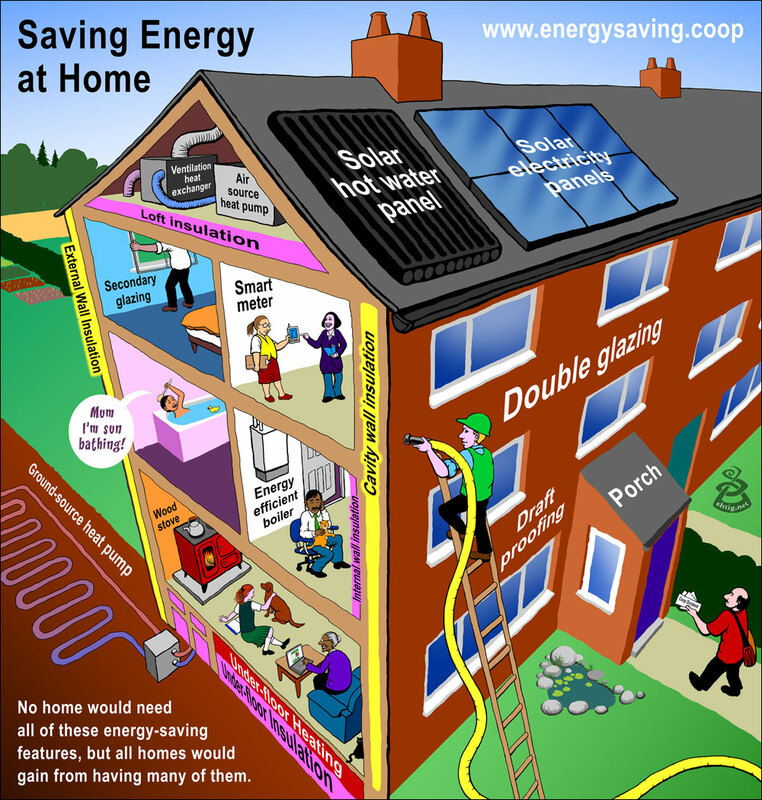 A cute little cartoon from around 2003 used in a number of places over the years..
A fun and silly cartoon I made around 1999 for People & Planet. 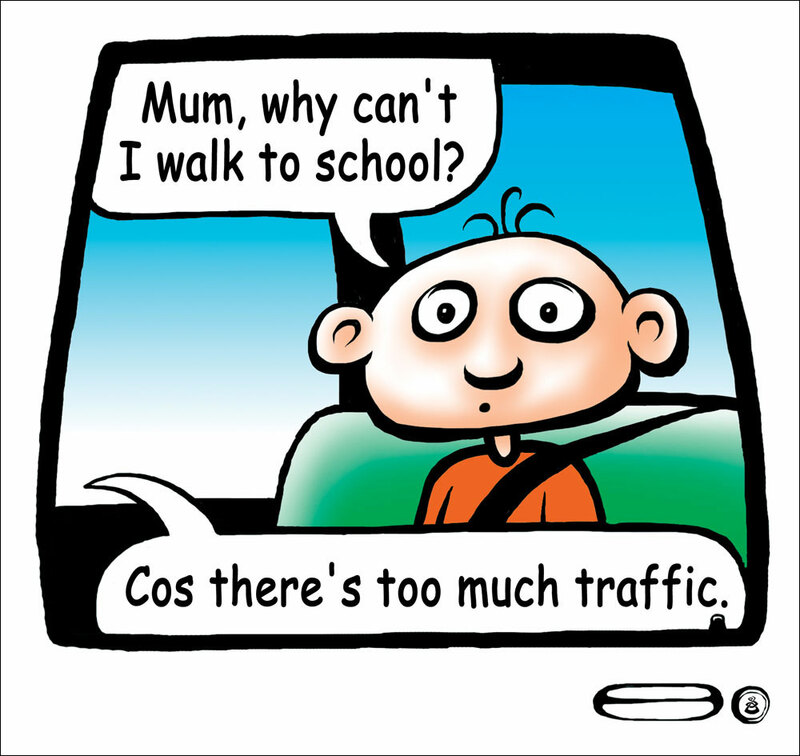 One of the first cartoons I ever drew that got published, back in 1998, for Rising Tide UK. This cartoon has been re-published in many places. A cartoon strip I drew back in 1988, at school. The words were crafted by my friend the talented Peter Kempsall. 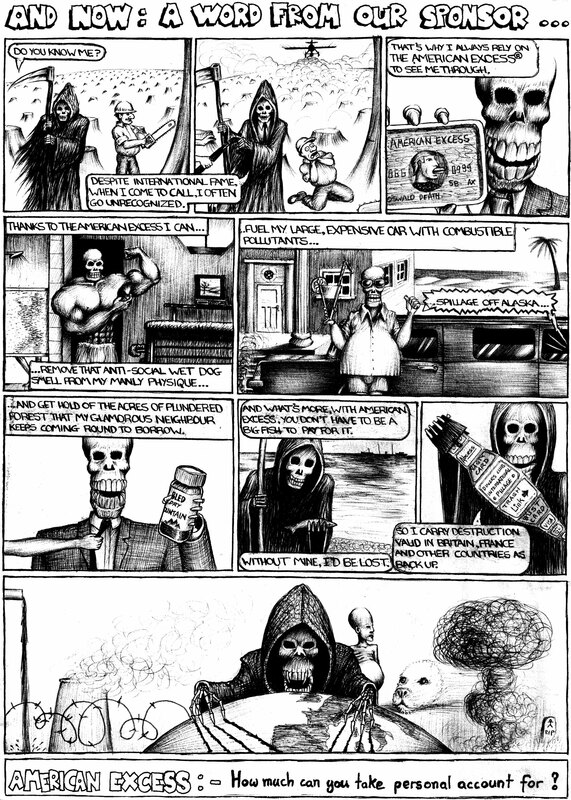 Its amusing and sad how the issues raised in this cartoon strip have only got worse in the 30 years since I drew this.